I think Twitterpated is way up there in my favorites list for paper packs - maybe its the Sweet Leaf color in it. My family room and kitchen are painted in a Sweet Leaf color I picked out a couple of years before becoming a consultant. Gosh, guess its time to think about re-painting the downstairs! The squirrel, acorns and sentiment all come from a retired set called Hello Friend that I bought because it has a fox in it. My youngest kiddo loves foxes and there aren't a lot of stamps or papers that feature that animal. 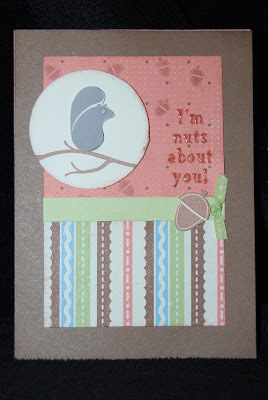 I was very happy to see one in the new set from CTMH Nature's Gift that came out in the Fall 2010 Idea Book. I want to use the big moose on that one to make a Merry Christ-moose card (yep, we run corny in this house!). It was a wonderful night last night - we finally had our Advantium Speed Cook oven installed yesterday and we were ALL totally pumped to have FAST food last night. We've had an Advantium since we moved into this house 10 years ago and we've gotten so used to using it daily that its been really hard since the old one died a couple of weeks ago. We have Martial Arts classes Monday through Thursday evening so having meals that are quickly prepared is an absolute must for our household and you just can't beat chicken tenders from frozen to crispy hot in 8 minutes (not to mention cooking a whole chicken in like 25 minutes). The new one has some additional features like Convection Bake, broil and bread proofing that I'm looking forward to trying out too. I figure the amount of money we've saved by not eating out over the years more than off sets the price tag of these ovens. When you can make a far better dinner faster than stopping by a fast food joint you just get out of the habit of doing that. My kids were so funny when they came home from school, they were jumping up and down with excitement and they all made hot snacks to try the new unit out. If you have kids or a really busy schedule these ovens are a life saver! I have a question for the webmaster/admin here at paigespaperparadise.blogspot.com.